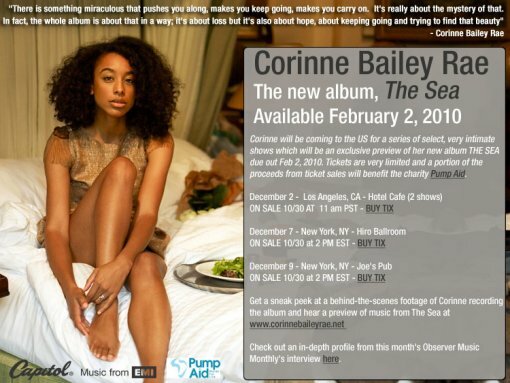 Corinne Bailey Rae is coming to town in December to preview some tracks off of her forthcoming album, entitled The Sea. The first show will take place on December 7, 2009 at the smallish Hiro Ballroom and the second show is happening at Joe’s Pub on December 9, 2009. Tickets for both shows go on sale (see links below) today (Friday, Oct 30) at 2:00 PM. They both oughta sell out pretty quick, but all things being equal, I’d probably go for Joe’s Pub gig (even though I hate it there when it is crowded). She’s also playing one show in LA, and according to her MySpace blog she’ll be playing a couple of UK dates as well (the only announced show so far is on November 23 at The Tabernacle in London).